Zero is an interesting concept. Is it the presence of nothing or the absence of anything? Is it a baseline from which to measure or a null point? Is it normal or is it failure? Is it a goal for which to strive or a default by which to reset? If you answer “yes” to any or all you are on good footing. Gil Rendle entitled his contribution to the Adaptive Leadership Series, Back to Zero, and it qualifies on so many levels. First, let me say the positive: there is some good and solid thinking here. I don’t disagree with many of the central ideas: paradigms shift and we are experiencing them all the time; the church is a system and systems are made up of processes — you can’t change the system if you don’t understand how it works; organizational theory offers a number of competing models for change (and the Spider/Starfish model is one of them — Jim Collin’s variation on Isaiah Berlin’s Fox/Hedgehog is another); and, leadership is the key to maximizing our potential. 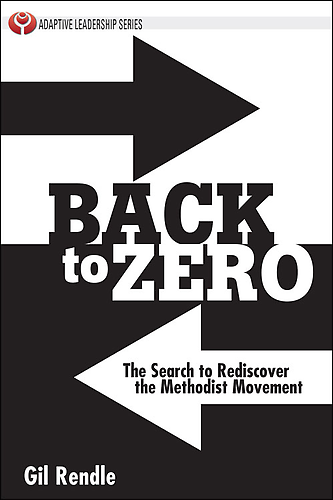 However, Back to Zero could easily have been called Back to the Eighties, or Back to the Twentieth Century, or Forward to the Past — there is nothing new or innovative here, but a mere rehash of the church leadership thinking in United Methodism twenty to thirty years ago. Dr. Ezra Earl Jones dragged Methodism kicking and screaming into the realities of shifting paradigms in the late 1980s, giving rise to the Quest for Quality/Quest/FaithQuest initiative of the late 20th and early 21st century. Drawing from Thomas Kuhn (paradigms) and Ed Deming (Total Quality Management), Jones brought systems thinking front and center to our denomination. For many, this was revolutionary thinking (in fact, the subtitle of Quest was “a new way of thinking…”). That was then, this is now. It is hard to get excited about a “new” book that was old a decade ago. Additionally, it is such a bleak and cynical book. Often, Rendle makes a statement about what we should do, then illustrates the point with examples of how we do something poorly or not at all. In the same way that you can’t prove a negative, you cannot cast a vision for the future based on what we are doing wrong or poorly. We need examples of how something works, not all-too-familiar examples of how we fail. The fallacy in the logic is that we never completely go back to zero. Too many people quote Thomas Kuhn (The Structure of Scientific Revolutions) without actually reading Kuhn. While it is fair to say that violent shifts in our world views can qualify as paradigm shifts, it is more reasonable to say that these shifts call everything into questions and challenge the “truth” or “validity” of widely held claims of “knowledge.” For example, “IF the sun doesn’t revolve around the earth, then everything we “know” in the geocentric paradigm is called into question.” Again, “IF the world is millions of years old, then everything tied to a “young earth” theory of history and development is challenged and cast into doubt.” The if/then nature of this scientific inquiry is essential and should not be overlooked. Paradigms are more than consensus or opinion. When we speak of them as world views, we are talking about a comprehensive understanding of reality from a particular perspective. Much of what we talk about in our culture or our church doesn’t actually qualify as a paradigm shift — though it sounds so much cooler and more important if we usurp the scientific principle! What has “gone back to zero” for us is not the validity of our claims to be a people of God grounded in grace and existing to share the good news, serve those in need, and strive to bring the love of God to a hurting world. What has gone back to zero is the “vehicle” in which we travel that is no longer getting us where we want to go. We keep being challenged to “get on the bus” to travel to new planets and alternative universes. I am not so sure the paradigm has changed so much as we failed to evolve along with the paradigm we are in. The world is changing in ways the church has not — but not because the church is incapable, but unwilling. A cell phone is not a paradigm shift from a land line, but an advance forward within a communications technology. The mega-church is not a paradigm shift within organized religion, but an advance forward from the old-time tent revival meeting. Strip away the tech and props and you have the same circus in different wrapping. The other critique I would make of the content of Rendle’s book is a persistent confusion over the difference between “outputs” and “outcomes” in systems theory. Rendle uses the terms interchangeably, while the discipline of systems theory does not. A process produces outputs that can combine to produce outcomes. An example. A birthday party. You may have a “cake process,” a “gifts process,” an “entertainment process,” and an “invitation process.” Each process has “inputs, throughputs, and outputs.” Cake process: inputs — ingredients, equipment, recipe, baker, etc. ; throughputs — mixing ingredients, pouring into pans, heating mixture, cooling, etc. ; outputs — dirty dishes and utensils, finished cake, hot kitchen, etc. One process in service to the outcome of a birthday party experience — linked to other processes. Outcome/outputs not the same thing. In church example, desired outcome = disciple. Processes might be, “worship process,” “study process,” “service process,” “fellowship process” — all with different inputs, throughputs, and outputs. The important principle here is that you cannot evaluate the effectiveness or impact of processes until you are clear on the outcomes. Just focusing on outputs gets us no closer to the Promised Land than measuring inputs and throughputs. This is the essence of systems thinking — you have to pay attention to the whole system to make sure it is producing the necessary outcomes. I find Rendle’s approach deeply confusing and not very helpful. I was intrigued to see the different takes between Barbara Wendland’s take on Rendle’s book [ http://www.connectionsonline.org/Connpdf/4-12%20corrected.pdf ] and yours. I may have to break down and get it for myself. At least one difference is the arena looked at. Barbara seems to be looking through the eyes of a local congregation and your focus seems to be on a denomination. Gil’s book is denominational rather than congregational, but I can see how the lense makes a difference. I also know for people who haven’t heard it all before, it has some real impact. As I say, it isn’t that the things said aren’t good, it’s just that they are not new and they add little to the conversation we have been having for the past thirty years. And I would note it deeply matters that we understand the difference between how congregations function and how denominational systems function– and the kinds of the interactions they can have. To extend Dan’s cake mix metaphor: Looking at denominational systems through the lens of congregations, or vice versa, would be like looking at the differences in they systems and processes used to bake a cake at home, versus the processes and systems needed to be a successful manufacturer and distributor of cake mixes. Both involve cake– but the processes and the intended outcomes for each are likely very different. Thank you for this critique of Gil Rendle’s book. I had nearly given up hope that anybody in the denomination would dare to raise questions about him. He seems to be a cult hero among our bishops. A team within Holston Conference’s Connectional Table engaged in reading together “Switch: How to Change Things When Change is Hard” by Chip and Dan Heath and also engaged in active workshop dialogue with the Heath brothers’ sister Susan Hayes. It is energizing Holston to seek to knock down silos and live, with positive energy, into the Call to Action.